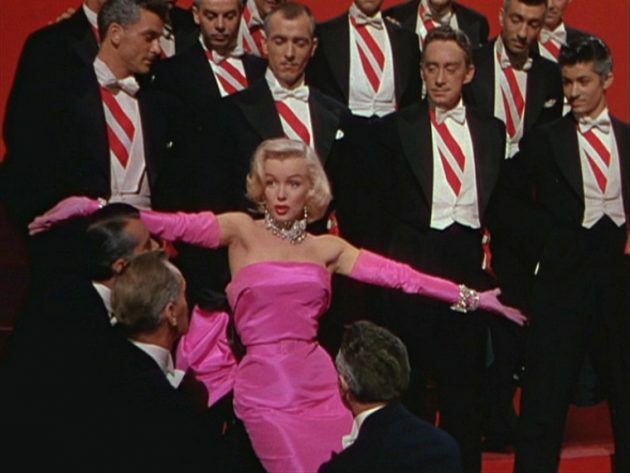 The popular phrase diamonds are a girl’s best friend dates back to the song of the same name written for the 1949 Broadway musical Gentleman Prefer Blondes and was later presented and immortalized in the 1953 film version of the show by Marilyn Monroe. Monroe sang of her desire for sparkling square and pear-shaped diamonds along with diamond baguettes from a man who “gives expensive gifts of jewels” from the likes of Tiffany, Cartier, Black Starr and Harry Winston in the legendary song. 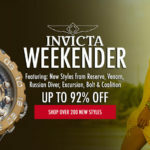 This summer, diamonds are once again a girl’s best friend with watchmaker Swiss Legend’s five new watch collections made expressly for women, featuring shimmering diamond accents. The five new Swiss Legend collections: the Layla, Paradiso, Passionata, Riviera and Seabreeze debut this week at WorldofWatches.com and each makes a glowing statement on the wrist. You’ll certainly want to retreat to breathtaking allure of the Swiss Legend Riviera wristwatch. The sporty and chic styling gets noticed with fashionably oversized case in premium grade stainless steel, highly polished to a lustrous, mirror-bright glow. The sleek and supple silicone strap comes in today’s top fashion colors, including black, red, white and navy. The stationary bezel in a satiny brushed finish has engraved markers and a distinctive v-notched edged rim. 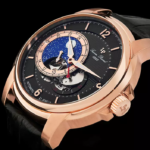 The striking fan-shaped outer dial surrounds the metallic center dial with skeleton hands. Highly stylized Arabic numeral and baton hour markers, along with a crescent shaped semi-skeleton date calendar adds to the stylish design. 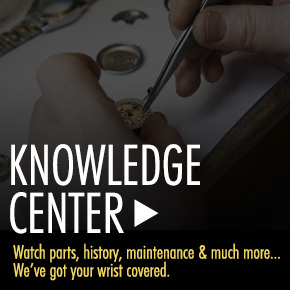 Features include quality Swiss-made quartz movement inside and water resistance to 100 meters or 330 feet. Swiss Legend Riviera women’s watch is 43mm in diameter, 11mm thick and comes in stainless steel and two-tone stainless steel. The Swiss Legend Passionata watch offers a highly impassioned direction in time for today’s woman in premium grade stainless steel, diamonds and leather. This graceful Swiss-made timepiece strikes a sophisticated note with a slim and slender 36mm diameter case and crocodile-embossed leather strap. Twelve shimmering diamonds accent the perfectly round bezel with glistening diamond-cut detail. The dramatic swirl pattern dial shines with luminous hands, Arabic numeral and outlined luminous hour markers. A window at the 6 o’clock hour reveals the automatic date calendar. Features include precise Swiss-made quartz movement inside and water-resistance to 50 meters. 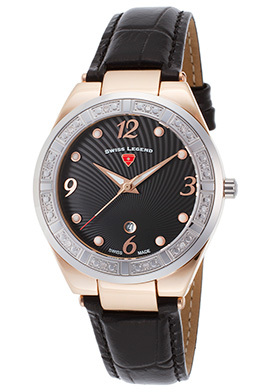 The Swiss Legend Passionata watch is available in stainless steel, rose gold-tone stainless steel and two-tone stainless steel. The Swiss Legend Paradiso watch offers classically elegant contours, right for today and always. This premium crafted Swiss-made watch features the generously oversized case in a contrasting brushed and polished finish, presented on a crocodile-textured leather strap. The stationary bezel with clipped edges is accented with eight diamond inlaid diamond markers and raised dot accents. The metallic sunray dial shines with three sub-dials, luminous hands, Arabic and baton hour markers. 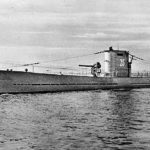 Features include date, day-of-the-week and 24-hour sub-dials. Additional features include accurate Swiss-made quartz movement inside and water-resistance to 100 meters. Twelve shimmering round-cut diamonds adorn the stationary bezel with a decorative coin-edge rim. The multi-layered dial shines with an iridescent Mother-of-Pearl outer dial and metallic center dial, luminous hands and raised, outlined Arabic numeral hour markers. A window at the 3 o’clock hour reveals the automatic date calendar. Features include premium quartz movement inside and water-resistance to 100 meters. 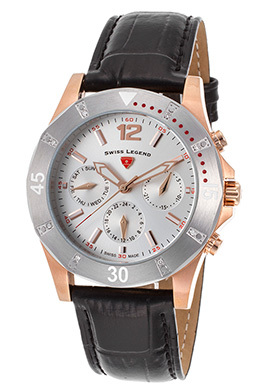 Swiss Legend Sea Breeze women’s watch is 35mm in diameter, 9mm thick and comes in styles of stainless steel and rose gold-tone stainless steel. 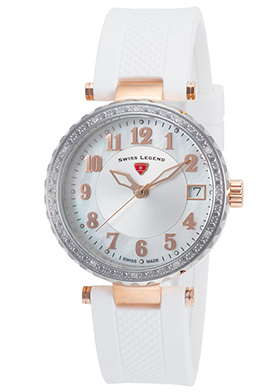 The Swiss Legend Layla watch offers a lustrous, glowing growing profile for today’s woman. 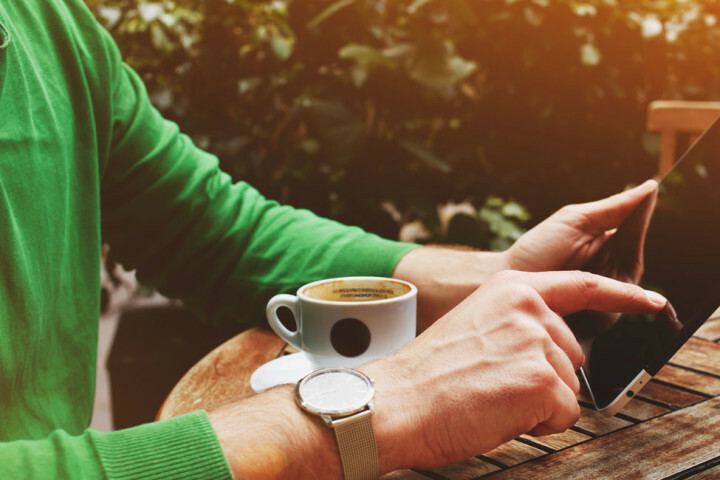 The modern, sophisticated styling is ultra-chic and trendy. This Swiss-made watch has a round 35mm diameter case polished to a lustrous patina. The supple silicone strap comes in popular fashion colors: black, white and red. Twelve shimmering diamonds dramatically adorn the perfectly round bezel with diamond-cut detail. The captivating dial has a mother-of-pearl outer dial, polished sword hands and outlined luminous dot hour markers. Features include a date window at the 3 o’clock hour, quality quartz movement inside and water-resistance to 100 meters or 330 feet. 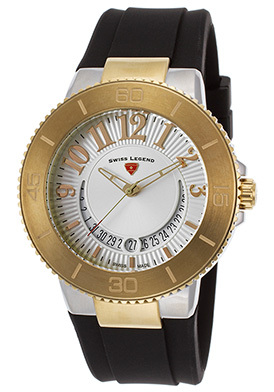 The Swiss Legend Layla watch is available in stainless steel, black ion-plated stainless steel and two-tone stainless steel. 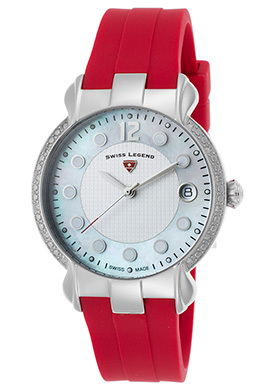 Each of these new Swiss Legend women’s watches feature a scratch-resistant Sapphitek crystal above the dial. Marilyn Monroe image from Gentlemen Prefer Blondes courtesy of Wiki Commons.